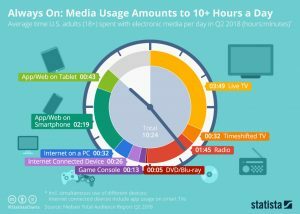 Always On: Media usage amounts to more than 10 hours per day in the U.S. It's no secret that people spend a lot of time with their smartphones and other electronic gadgets these days. How much time that actually is, is astonishing nonetheless: according to Nielsen's latest Total Audience Report, Americans aged 18 and older spend roughly ten and a half hours a day watching TV, listening to the radio or using their smartphones and other electronic devices. Considering that most people are awake 16 to 18 hours a day, 11 hours of electronic media usage seems like a lot, but, to be fair, much of that probably happens while doing other things at the same time. It's a good thing people were given the ability to multitask; otherwise we wouldn't get a whole lot done these days. Research firm Statista has put together a stunning visualization that breaks down consumption by device. You can see more here.